A new, limited collaboration beer from two intriguing breweries just dropped in the area and I decided to give it a go. Brasserie Fantôme is well known for their saisons, which, when right, are delicious. Hill Farmstead was recently voted upon as the #1 Brewery in the world by ratebeer. They make fantastic saisons, amongst other things. So in Novemeber when Hill Farmstead posted on their Facebook page 133 pictures in an album called “Belgium Trip 2012 – Fantôme Brew Day!” there was a lot to be excited about. 5 Sciences Beer pops open and pours dead flat. Uh oh. The color isn’t well captured in this photo, in that it seemed even brighter and opaque in person. It has a consistent color that reminds one of a commercial product that I will identify momentarily. The smell on this beer is slightly smoky, which seems out of place and then big blasts of citrus fruit. It’s hard to describe in comparison to other beers, however it has a very clear comparable, which I will again leave for the taste breakdown. It doesn’t taste quite as smoky as it smells. What it does taste like is slightly watered down artificial flavored fruit juice. 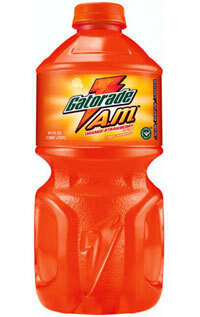 In fact, it brings out a powerful taste memory for me: Gatorade AM Orange Strawberry. In fact, it looks like Gatorade AM, and if you omit the smokiness which seems quite out of place, it smells and tastes like Gatorade AM. Even the completely uncarbonated body goes down like a Gatorade. Let me put it all together here – this beer is not bad, it just is not something that really is all that identifiable as beer. There is not alcohol heat, nor is the flavor offensive, however I doubt that anyone spending some good coin on a Fantôme/Hill Farmstead collaboration saison is expecting to be treated to something most comparable to an obscure Gatorade flavor. I cannot recommend this as a beer. Further, I am not really sure how they accomplished such a strange beer. This was a real letdown from two brewers who have the ability to make the best of the best. Oh well – there’s always the next beer. Wow, it sounds like I didn’t miss out on much leaving before this was opened. Also, happy birthday!